Brand new to this forum, but it seems there are friendly and knowledgeable people here! 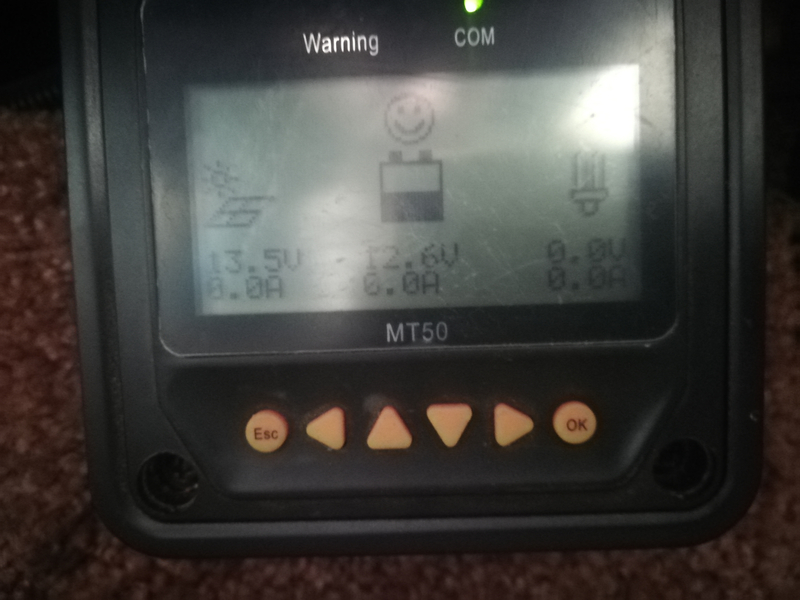 First of all, the MT-50 isn't a charge controller. Where is and what is your charge controller? If you do, in fact, have a charge controller Tell us what it is and what you have for solar panels. If an MPPT controller you want higher voltage into the controller. Your solar array and/or solar array wiring appears to be having problems. Your array should be around 21-22 volts with zero current (Voc--voltage open circuit). Assuming that the panels are getting full sun (no shade) and it is something like 10am-2pm local time (i.e., full/direct sun on panels), and with a PWM type charge controller, the current should be Varray will be something near or ~1 volt or so over the battery voltage (i.e., if full sun, battery charging with X amps from panels) or >~12.7 volts (battery typically needs ~13.6 to 14.8 volts to charge--Assuming flooded cell lead acid) with ~13.6 volts the "float voltage" (battery fully charged, just enough current to keep the battery full) and ~14.8 volts Absorb Set point (maximum charging voltage, held for roughly 2-6 hours for full charge). I would go through the solar array connections (in j-box if wired there), the connectors if using those, and the wiring to the charge controller. And from the controller to the battery bank. It would be handy if you have a volt meter of some sort, and can measure the voltage at different points in the system. Ideally, more information as Littleharbor2 asks... The brand/model/type of charge controller. 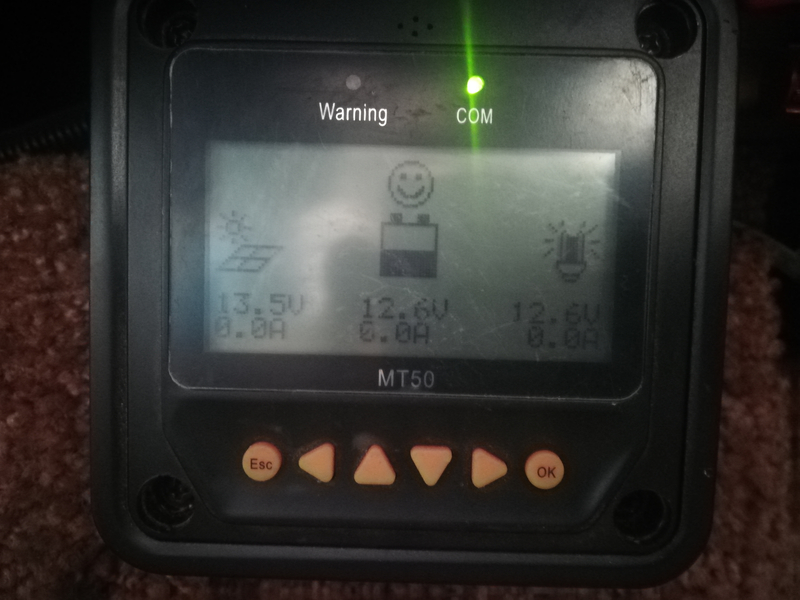 The solar panels Vmp/Imp ratings. And how they are wired (2x panels in parallel, 2x2 panels in series/parallel, etc.). Given that it "used to work", I am guessing it is poor/corroded/lose electrical connections somewhere in PV array -> charge controller -> battery bank (connections near the battery bank can get corroded from venting gasses+electrolyte). Thank you Little Harbor, and BB~ I am traveling and thus don't get a lot of Internet time. But I have received your comments, and I will experiment a bit more and get back to you! I know the sun exposure is quite inadequate where we are currently parked. . . plus the panel is mounted flat on the roof, and also shaded by a roof vent. This all combined with low-angled Sun in Winter. . . I think this may simply be the issue. But I am going to observe the system in different sun-conditions and see if the problem remains. The "used to work fine" system had 900 watts with panels wired in parallel. But now I have only one 170W panel. . . Also, I have an MPPT Tracer4215B. I'd look into getting at least one more 170 watt panel. I'm basing this on the assumption that the 170 watt panel is a 36 cell (12 volt) panel. You need to series wire two panels together to get the input voltage higher. Also do whatever you can to prevent shadowing on either panel. That controller is a 150 Voc. max controller, btw.